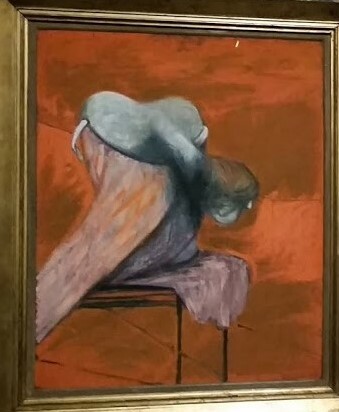 When I talked previously about not understanding a Francis Bacon painting when I was younger, this was the one. And last Saturday, I got to see it again. Before I went to see the show I was reading a bit about Bacon and found this quote from art critic John Russell: “there was painting in England before the Three Studies, and painting after them“. I’m clearly not the only one affected by it, then. But why is it so affecting, and important? There’s a lot going on here, so let’s start with the basics. 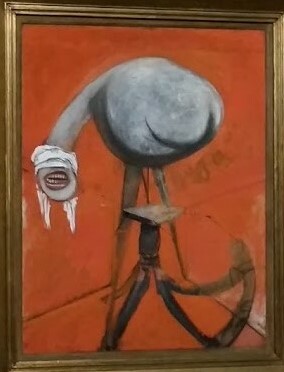 “Three Studies for Figures at the Base of the Crucifixion” was painted in 1944, exhibited in 1945. Emotions were running high for many people at the time for obvious reasons, and this painting gets to the heart of this pain. A theme I have discussed previously is that of colour choice, and I feel that is a big part of why these studies are so affecting. When thinking of associations with orange, particularly this shade of orange, my first thought was ‘fire’. It’s the colour I would imagine the sky to be if a city was burning at night. It’s a colour that disturbs rather than delights, and the effect is heightened by the contrasting blacks and greys. That’s before we even begin to discuss the figures themselves. Cruel, menacing, full of despair, each one seems to represent different emotions. Bacon was apparently partially inspired by the idea of the Eumenides – the Furies of Greek mythology. You can imagine them waiting, ready to inflict their wrath on whomsoever so cross their path. These figures, created in this colour pallette, are the stuff of nightmares. Then there’s the subject: Figures at the base of the Crucifixion. A topic which loads these figures with meaning before you’ve even seen them. But Bacon was an atheist, which left a useful distance between the story and his interpretation of it. I have already referred to Greek mythology, and although nobody believes in the gods of the past anymore, the stories and characters are still meaningful symbols. Bacon is using the subject of the crucifixtion in the same way, as a story that in Europe is associated with grand tragedy and the folly of human beings (“Forgive them…they know not what they do“). As the name suggests, apparently Bacon once planned to create the entire crucifixion scene, but this plan never came to light. Perhaps the enormity of what he would need to use the figure on the cross to signify was too much. But these figures, a complete perversion of the saintly and pure, speak loudly enough by themselves. Was art so different after these paintings? There had of course been artistic responses to World War One, but after WWII a more pessimistic and cyncial outlook on life became more widespread. Abstraction took off, partly because there were things which people had seen and done which figures were no longer enough to express. I could never say that Three Studies is one of my favourite works of art. But I can appreciate how successful it is as a cipher for the brutality of the 20th century. 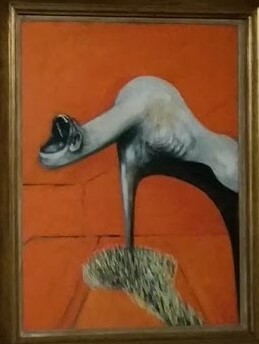 This entry was posted in Home, Let's Talk About It and tagged art, Bacon, Crucifixion, culture, Francis Bacon, Liverpool, mythology. Bookmark the permalink.